Cops responding to a 1:45 AM disturbance at a residence in Sebastian encountered Pamela Alonge, who apologized for arguing loudly with her boyfriend in the home’s backyard. When asked multiple times to identify himself, the boyfriend refused and was “being evasive and argumentative with officers at the scene,” according to an arrest affidavit. After cops handcuffed the man, they took one more shot at extracting a name from him. “At which time he said his name was ‘Captain Dickhead,’” an officer reported. 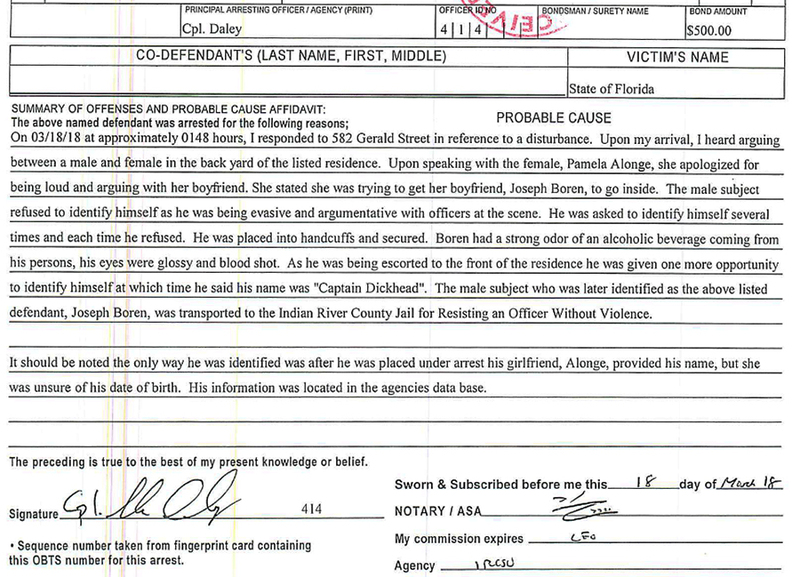 Investigators subsequently identified “Dickhead” as Joseph Boren, 25. He was arrested on a misdemeanor obstruction charge. After eight hours in custody, Boren (seen above) was released from jail on his own recognizance. Boren is scheduled for an April 17 court appearance. 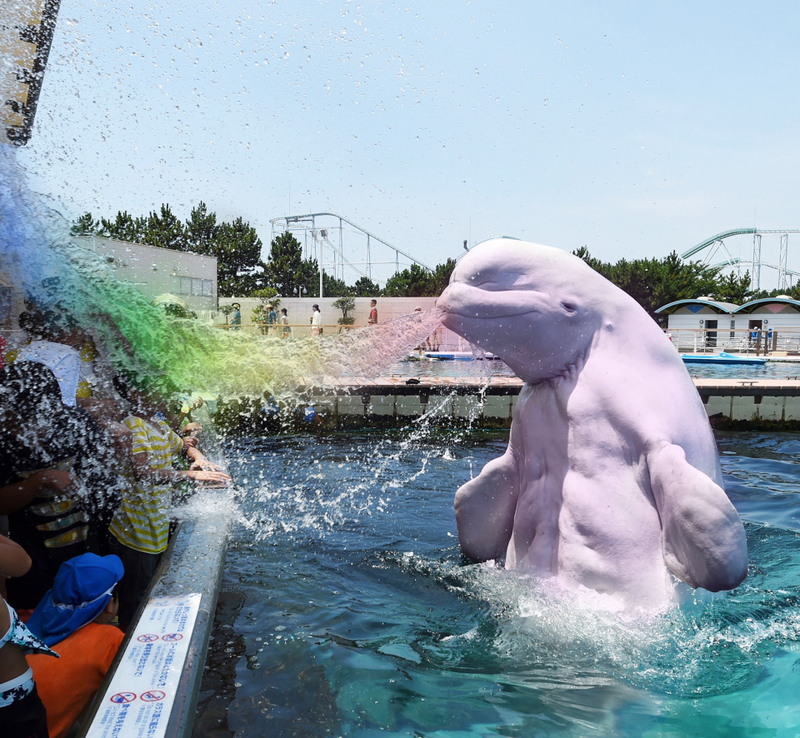 The beluga whale shows an unnatural pink skin, an exhibit ofgenetically engineered homosexuality first found in pink river dolphins. As temperatures soared to nearly 100 degrees in San Antonio, the families gathered at the water park for last moments of summer fun were shocked to find the whale aggressive, muscular and spritzing rainbow colored cold water from its mouth. A man is accused of shooting another man in a dispute over loud music at a gas station, Daytona Beach police said. 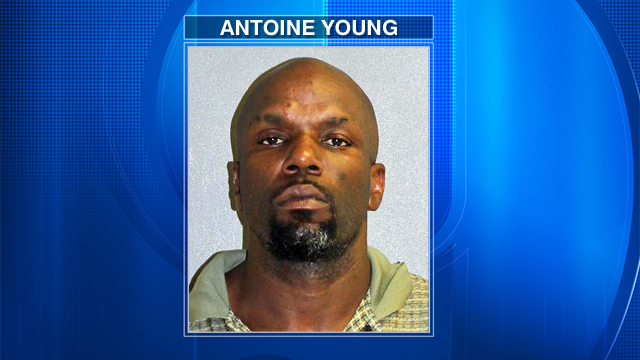 Antoine Young, 38, was arrested following Saturday night's incident. An arrest report said witnesses told investigators that the victim was standing outside the A1A Market and Deli playing music with a friend when Young began arguing with the victim to turn down the volume. According to the report, witnesses said Young shot the victim in the leg. The victim was taken to a hospital for treatment. Young faces multiple charges, including aggravated battery with a deadly weapon and possession of a firearm by a convicted felon. Young was being held on bail. A substitute teacher was arrested Wednesday after Sanford police said she was teaching students while she was intoxicated. Sanford police said Holly Joel is charged with child neglect, disorderly intoxication and interfering with school administration functions. Police said that a school resource officer assigned to Bentley Elementary School was notified on Tuesday by school staff that a substitute teacher was possibly intoxicated while she was working. 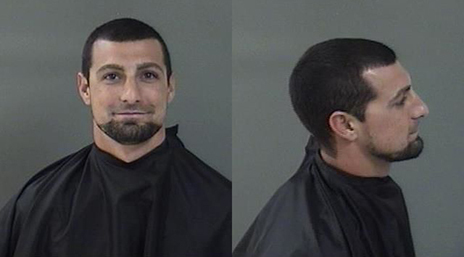 Joel was arrested and taken to the John E. Polk Correctional Facility. A bow-tie wearing duck has been injured in a drunken pub brawl with a local dog in Chulmleigh, Devon. The booze-loving bird, affectionately named Star, was enjoying a pint in The Old Courthouse Inn with his handler, Barrie Hayman, when Hayman's canine Meggie sparked a bar brawl. Star was left with injuries to his beak after the fight. The man who gained notoriety for taking over New York City subway trains is once again in hot water, this time for stealing a Greyhound bus from a Port Authority terminal. It was initially said to have been taken from New Jersey, but was later discovered to be stolen from a Manhattan depot, according to the Associated Press. A woman was arrested after stripping naked and smearing ketchup all over her body in a bizarre incident at a fast food restaurant, police said. Angelic Isabella Valle faces charges of lewd and lascivious conduct following the x-rated show, which was filmed by onlookers and posted online. Police said the 23-year-old walked to the second floor of the Miami Beach fast food restaurant on Ocean Drive. When Joyce Kingsley heard “kaboom” while at her Michigan home, she immediately thought about extreme weather. 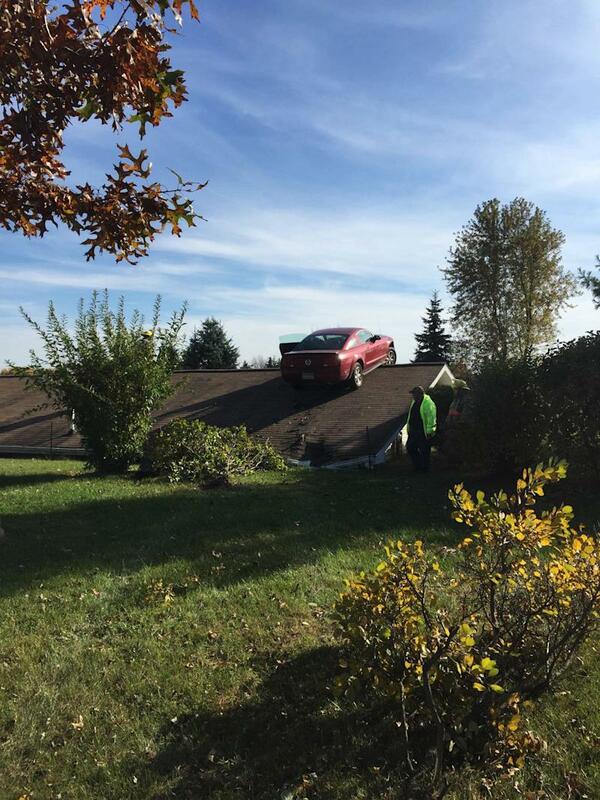 The 83-year-old needed to look up: A Ford Mustang was parked on the roof of her home after the driver had a medical problem Monday and lost control on Interstate 69 in Shiawassee County. Kingsley’s home about 20 miles northeast of Lansing is built next to a hill, and the roof is nearly level with the ground, The Argus-Press of Owosso reported. “The driver is extremely lucky,” Trooper Ben Rowell said. Kingsley plans to put a tarp over the damaged roof until it can be fixed. After binge watching a popular show about zombies, a New Mexico man believed his friend was turning into one — so he brutally beat him to death last week, police said. Prior to the alleged crime last Thursday, Damon Perry, 23, watched the Netflix show "The Walking Dead" and drank "multiple" 40-ounce bottles of malt liquor with a friend at a relative's apartment, Grants Police spokesman Moses Marquez told NBC News. Then, Perry told police, the victim, Christopher Paquin, 23, tried "to bite him," according to a statement from cops. Perry "reacted by brutally beating" Paquin with his hands and feet, the release said, and also used an electric guitar, kitchen knives and a microwave to kill the victim. At some point, Perry left the apartment and began chasing neighbors, Marquez said. After following one woman with a knife, Perry forced her to lock herself inside her apartment. No additional injuries were reported, though assault charges are expected, Marquez told NBC News. When police arrived at the apartment complex around 1 p.m., two maintenance workers were restraining Perry in an apartment doorway. Inside, police found Paquin's body. He was pronounced dead by paramedics. 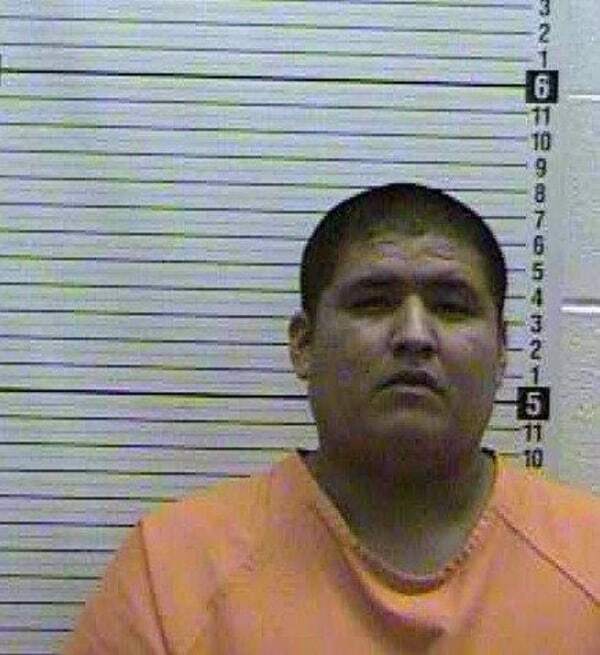 Perry was being held at Cibola County Detention Center. A clerk at the county's magistrate court, Naomi Ronquillo, told NBC News Monday that Perry did not yet have a lawyer. A 480-pound Martin County woman has died after emergency workers tried to remove her from the couch where she had remained for about six years. Woman Stuck To Couch 081104 Gayle Laverne Grinds, 40, died Wednesday, after a failed six-hour effort to dislodge her from the couch in her home. Workers say the home was filthy, and Grinds was too large to get up from the couch to even use the bathroom. Make a contribution! Submit Suggested Content Here.